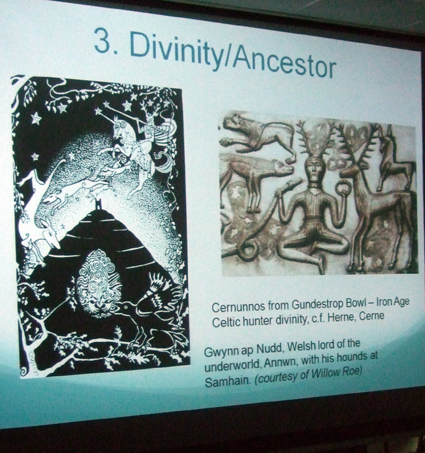 Last Saturday I went to Seriously Enchanted, the Assap conference on faeries and associated folklore, which was held in Bristol. All the Assap conferences I’ve been to have been brilliant. The speakers are always excellent, offering a wide range of insights into the topic in question – which in the past have included vampires, ghosts, demons and witches. Seriously Enchanted, although smaller than the previous conferences, was just as good. Mark Norman talked about black dogs and the wild hunt, Dr Serena Roney-Dougal revisited the Faery Faith, Christian Jensen Romer (CJ) looked at the psychical dimension of faeries, Jon Kaneko-James talked about faeries, witches and cunning folk, Dr David Siver explained how UFOs might have developed from the Faery Faith and finally there was a panel discussion. While all the talks were really fascinating, the one that I’m going to write about in depth here is Jon Kaneko-James’ look at a witch trial in Rye in 1607 concerning Anna Taylor and Susanna Swapper and a case about summoning faeries to search for treasure. Jon explained that witch trial records often contain little information about what the witches in question were supposed to have done, but in this case, known as Rye 13-1, there are about 40,000 words of primary source evidence showing faery witchcraft. The documents include letters between lawyers from the town of Rye and the Marshal of Cinque Ports. In the year 1607, the new witch-hunting king, James 1, had just come onto the throne and people were quite touchy about witch cases. The 1607 Rye trial lead-up took 5 years and the documents show many different points of view, which allow us to study a real historic tradition of authentic folk magic. Susanna described having had a night-time visitation, which started the witch trial. She said she was in bed with her husband when she saw four spirits - two men and two women wearing white and green garments. She said they wanted to take her away, but didn’t succeed. She called to her husband and woke him and asked him to hold her, but he saw nothing, rolled over and went back to sleep. Susanna discussed this with her landlady, Mrs Anna Taylor, who it emerged was quite knowledgeable about dealings with faeries. She told Susanna that if it happened again she should call upon God. She said she should ask them in name of Father, Son and Holy Ghost where they came from. According to the records, Susanna saw the faeries again, who told her to go back to her landlady, but to call her young Anna Bennet, instead of Mrs Anna Taylor, then to go to garden and do some digging. She agreed. Susanna said that she and Mrs Taylor dug in the garden and heard a strange sound, after which Mrs Taylor thrust a spit in the garden, then went into the summer house and threw a stone. It later emerged that it wasn’t the first time people had dug in the garden for treasure or had contact with faery beings in the house. Mrs Taylor said the previous occupant, Mr Pywell had dug in the garden for wealth, but unsuccessfully, and that Mr Pywell later died. Mrs Taylor stopped giving evidence about this, but expressed regret over Mr Pywell’s death. A few weeks after the first incidents, Susanna was encouraged by Mrs Taylor to visit ‘the Queen of the Fearies’ during the daytime. However, Susanna refused to give obeisance to the fairies, despite being told to. Zachariah was a real person, a cunning man. Ten years before this trial, there was a deposition that his advice had been sought in a case of witchcraft. He recommended getting blood from the witch to end her influence. Anna Taylor is clearly the daughter of a wise woman, old Anna Bennet, and there is a lineage of visions of seeing fairies. A confusing statement at the end of the deposition regarding Mrs Taylor said that “they spend her daily a great deal of water”. Rye is on a marsh so nothing special about water, but in Paracelsian magic there are lists of medicinal waters for curing illnesses – they are called strong waters. The depositions contain many mentions of strong waters. For example, in 13 8 Susanna describes going into room where faeries lived, in her hall of Mrs Taylor’s house, to see if spirits were there. She said when she was there she heard a spirit called Richard, willing her to go to Mrs Bennet and take her some planet water. This could be a distillate. In another instance, Anna Taylor tried to get Susanna to take her son to the room with the faeries with an offering of flowers. At first nothing appeared, the second and third time they went the child became scared. After that she would not allow children in the house. 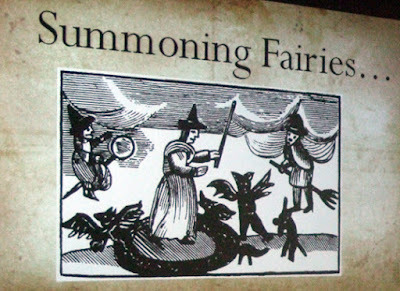 Obviously these descriptions are a little unclear about what was going on, but could they really be summoning fairies? Plenty of magicians using grimoire traditions did call up faeries as well as other spirits. Several magical books give descriptions for summoning faeries, including Oberon, using hermetic ceremonies. One even gives instructions for summoning faeries with ‘spits of wood’. Mrs Taylor seems educated – she could obviously write as she wrote in the case documents. She got away with being a witch because King James intervened and got her released from prison. 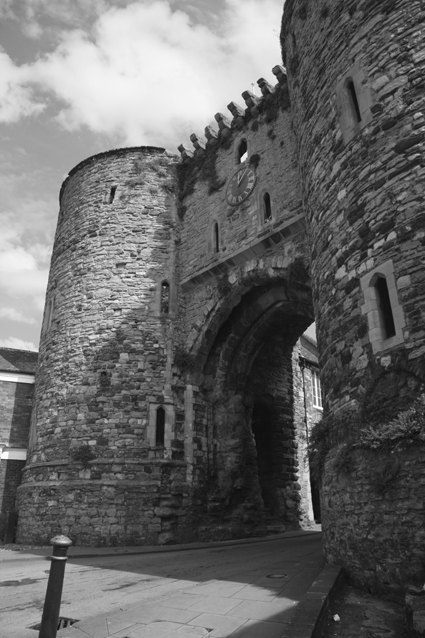 Contrary to popular belief, King James was often as keen on debunking witches as he was on prosecuting them. 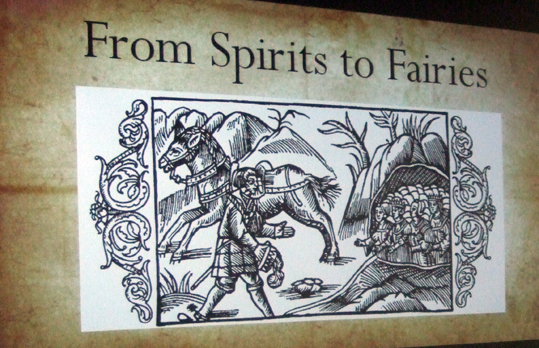 Jon’s talk offered a fascinating glimpse into historic witchcraft practices involving interactions with faeries. For further reading, he recommended a book called Rye Spirits by Annabel Gregory. I’m going to add this to my wish list.